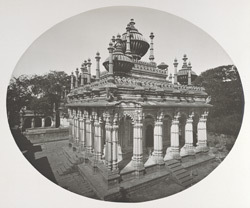 Photograph of Maija Sahiba's Tomb at Junagadh, Gujarat, taken in c.1900 by an unknown photographer, possibly the Solankee Studio, Rajkot. From the early 18th century onward Junagadh was ruled by the Muslim Babi dynasty, established in c.1735 by Sher Khan Babi. It belongs to the Curzon Collection: 'Presented with feelings of friendship and sincere admiration to Lord Curzon of Kedleston, Viceroy and Governor-General of India, by H.H. Rasulkhanji, Navab Junagadha. 1900'. Their tombs, known as maqbaras, are situated in enclosures within the city walls in two groups dating from the 18th and 19th centuries. They are some of the most extraordinary and fantastical buildings in Gujarat. The mausoleum in this view was erected by the mother of one of the rulers of Junagadh, probably Nawab Mahabat Khanji II (rule 1851-1882) and contains her tomb. It is a free-standing structure with a square plan inside a walled enclosure. The inner tomb is surrounded by a colonnade of delicately-carved cusped arches crowned by a cornice, clusters of onion domes and small minarets. It is covered with a profusion of delicate carved ornamentation.